Simon Howat grew up in South Bucks and was a scholar at the High Wycombe Music Centre. He studied music at Christ’s College, Cambridge, then post-graduate Piano-Accompaniment at the Guildhall School of Music and Drama, London. Over the last twenty-five years, Simon has built up a busy portfolio career, both as a pianist, and as a peripatetic piano tutor for Buckinghamshire Music Trust. He has given acclaimed performances of Grieg’s Piano Concerto, Beethoven’s Emperor Concerto and Gershwin’s Rhapsody in Blue. Simon now also works across the country as a music examiner for ABRSM. 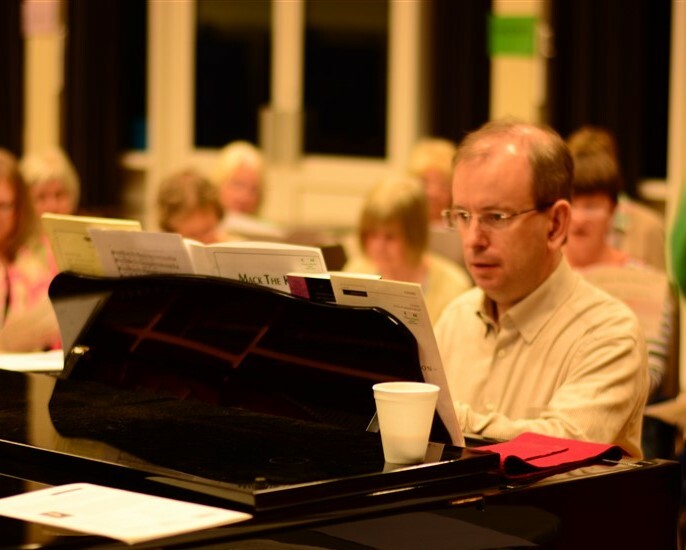 As the regular rehearsal pianist for the Wooburn Singers for more than two decades, a wide variety of choral repertoire has passed under his fingers. Highlights among his concert and Come & Sing performances with the choir have included: Ein Deutsches Requiem, Carmina Burana, The Rio Grande, Belshazzar’s Feast, Rachmaninov’s The Bells, Dvorak’s Stabat Mater and Dyson’s Nebuchadnezzar. Simon’s close collaboration with Tom Hammond-Davies at Wooburn Singers, has resulted in some stunning re-interpretation of Gershwin’s original manuscripts, which Simon performed in West Wycombe and then at Wooburn Singers’ debut concert with the Brandenburg Festival of London.